Here’s one way to look sharp: laser-cut aerospace grade aluminum. That’s the material found in the buckles made by Grip6—a company specializing in rugged, low-profile belts. With a smart, minimalist design that’s ultra trim and insanely strong, every belt is made from nylon webbing with a breaking strength of almost two tons. The no-holes design adjusts to your perfect length. The extra flap tucks neatly inside—out of sight—and the buckles are curved ever so slightly. The result is a streamlined, smooth fit. Founder BJ Minson found a lot to dislike with traditional belts. The stretched out holes, the limited range when adjusting, the extra flap. When a friend gave him an army belt, BJ was inspired by the simple design. He started to create the belt he always wanted. BJ put the G6 on Kickstarter, and lots of other people wanted his belt, too. All of the belts and buckles are interchangeable. And they are all are made, to last, in the USA. Hello everyone! I'm proud to introduce the G6 belt to The Grommet. I'd be happy to answer any questions you have! How long are the belts? @Carol Hi! The belts come in a variety of sizes (30, 32, 34, 36, 38, 40, 50). They also have an extra several inches for adjust-ability. @BJ So if someone wears a 36" waste jeans, they would need a size 36 belt? @crystal you can see all the available colors when you go to the products. @Mark Yes it's just the one side. It's a little different than most belts, but it ends up holding far better than other friction belts that have to be tightened throughout the day. The Grip6 belt stays tight all day long and never needs to be tightened. Love the simple clean design! One question: with regular use (cinching it to the same spot on the strap day after day), do you ever have trouble with that spot on the strap becoming slippy, not holding its position? @Joe Great question! I've been wearing the same belt for over a year and it doesn't have any problems. It still holds tight and doesn't slip. @BJ Excellent--thanks for confirming! Looking forward to receiving mine. @Joe Awesome! Thanks for the order! I have a 45 inch waist ....do I order a 50 inch? @Gae yes. The 50 inch will work great. If you find it's a little too long, they strap can always be cut down a little. If you do that, I would recommend melting the end just a little to prevent fraying. Being a petite female- 105lb, the buckle is a bit wide and long for me. Do you have different sizes? @Dawn because we're relatively new, we only have the one size for now. We are planning on adding a narrower size early next year. @BJ Please measure some belt loops on women's pants and use that to create a narrower size. Then I would definitely order one. Sounds like that is in their plans, Lynne! @Mike I am also looking for a narrower belt for ladies pant. Hope it is out soon...I am so tired of belts falling apart. @KATHIE and @LYNNE we're working on a custom strap material that looks awesome. It's being developed right now with a US based manufacturer. When we finalize it, we will get two different widths (mens and womens). It should be available early next year. 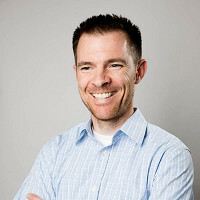 @Andrew That's an awesome idea! We may be able to work something out. Hi, I like the concept and just ordered a belt & buckle. The money was taken from my paypal account, yet I'm showing no orders in my account...does it no show up for a period of time? @Robert thanks for the order! I don't know the details on the back-end. I'd say give it a little time and if it still doesn't seem to be working, contact The Grommet through their website. Thanks! I like the idea of this belt, but I am a woman and really need a curved belt. Can you find a product that can adapt to a curve for the belt itself? The buckle looks like it is great! @cynthia thanks for the comment! I'm not 100% sure what you are asking. Our buckles are formed with a curve (about a 12" diameter). It makes them very comfortable because they fit around the body very nicely and don't dig into you or pinch like a lot of belts tend to do. Let me know if I can clarify anything else for you. Thanks! I'm digging the style of the belts. I was wondering if these can be worn by women too? I was thinking about getting some as gifts. @Neal great idea! The Grip6 belt has been very popular with both men and women. It's a standard 1.5" wide and it fits most pants. We have a lot of men purchase a second belt because their wives stole their first one. A lot of women like the fact that they are so flat and low profile. This looks terrific! I so wished I didn't buy a similar belt on Grommet. It was a low profile as well but was a shiny, thin black plastic! Very cheap looking - probably why they say it is good under tops. This looks good enough to show off! Nice job. @Eileen thanks for the comment! We make these ourselves here in the US to make sure they are the highest quality. They last forever too. This is a great idea! Will you be producing a wider belt/buckle than 1-1/2"? I wear 1-3/4" belts with my Wranglers; 1-1/2" is too narrow for the belt loops. @Louis Thanks! We are sort of stuck at some standard widths because of the military webbing we have access to at this point. It might be something we can do in the future, but I haven't seen any of the same military webbing in the 1-3/4" widths. 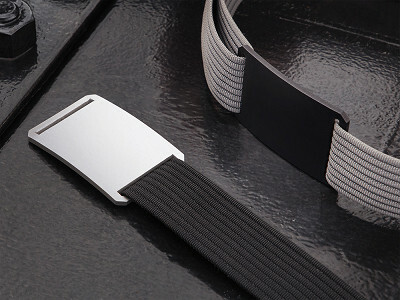 what are the dimensions of the buckle? @SM the buckle is about 3 inches wide and 1.8 inches tall. It's also only 1/8" thick making is very low profile and comfortable. @BJ how will this belt work as a weight carrier?cell phone,handcuffs,sidearm,radio etc? @Humberto @chase, It works awesome! I've had customers send me pictures of the belt carrying a gun and knife on a hike into the mountains. He said it worked perfectly and never needed tightening. Hi BJ. I love the belt. I may have missed it in the video - but how does the buckle undo? @Adrian the video doesn't show a lot of video on how to put in on and take it off, but basically you just stick your thumb under the strap next to the loop and push out and it slides right open. It's a little different than most belts but after you put it on once or twice it super easy. I would have ordered this right now if the black strap had black stitching/. Maybe an option you might want to consider. I will keep checking back to see if it is an offer in the future. @Debi thanks for the comment! @marlene all of the straps have a black stitching on the back side and they're reversible. So you actually get two belts in one! So if you go with the black strap with grey stitch, the backside is black and you can simply flip it around for a black belt. @BJ I don't understand how it could be reversible as one side is stitched to the buckle. If it's turned over, the curve of the buckle would be facing away from the body. Hi Dianne, you can take the buckle off very easily so that will not be the case! @Dianne if you look at the video in the comments on how to put the belt on, it shows how it's designed to come off and easily interchange with another buckle. I designed it to be versatile and simple (less sewing for me). Awesome product! I know it wasn't designed as a "gun belt" but is it strong enough to hold up heavy items attached to it? Is it very flexible (not stiff) to where it may bend down with weight?.. I love the design and the look, and would highly recommend it for "normal" belt application.. thanks..
@Humberto the strap is relatively flexible. It's definitely not a stiff solid gun carrying style belt, although I have had customers that do carry with this belt. It never slips, but it would probably bend a little with heavy weight attached to it. You might want to check your pricing on the combination. It costs $.05 cents more to buy the combination than it does to buy the items separately. @Susan hmmm... I would say just purchase them separately. Your website shows many different colors for both the belt strap and the buckle. But the only buckle color is Blue. You let the consumer pick the strap color, but not the buckle. This doesn't seem right. Can you fix this? Hi Elizabeth, I'm not sure I understand your question. There are multiple options for belt and buckle here. If you click on the images, you will see the options available. @Garry thanks for the interest! The black/grey strap option only goes to 40"? @Brian it should go up to 50". I just checked and it's working for me. @BJ The strap menu only opened down to 40" for me. After checking the full belt menu options that show 50", I went back to just the strap and now it shows all the way to 50". Thanks for the follow-up. @Brian no problem! Glad you got it to work. It looks like the buckle is easily removable from both sides. Does it ever slip off if you have undone one side? When using the washroom, for example. @Bernadette the buckle is symmetric, meaning you can thread it from either side or flip it upside down and it works and looks the same. 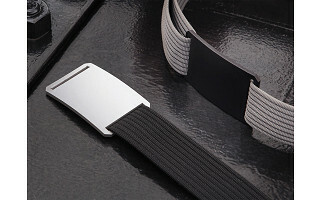 The end of the strap is melted with a low profile "T" shape which keeps the belt from sliding out the one end. It won't slip off when using the wash room. Could you please edit the video to include how to put on the buckle (if purchased separately) and how to latch/unlatch it? Thank you. @Judy Here's a short clip on how to put it on and take it off. why is it that absolutely no one that launches on this site feels it necessary to provide for the big and/or tall customers? Devan, I don't think they find it unnecessary in the slightest. I think, or rather know, that most Makers are just starting out so product development is not at its height. Very similar to why many tech developers start with availability to iOS, fashion takes a little while to reach full availability. But stay tuned, because with enough support they can reach that point in their business! @Devan we make these ourselves and if you need a different size, let us know. We can accommodate. I would also like a larger size for someone with a 51 inch waist. Would the 50" be long enough? I would prefer to have a little extra room, just in case. Little expensive for separate buckle and belt. For $35 I can get a very fine "genuine" leather belt, that serves the same purpose. Hi Shelley, thanks for the comment. You're right in that it will serve the same purpose as a belt, but this an alternative to a leather belt, not a replacement. There are a few key differences between Grip6 and the very fine "genuine" leather belt you're considering. For one, Grip6 is Made in the USA and that is awesome. Like, really awesome. Everyone on site always wants Made in the USA products and here we have one! Two, there are no holes on the Grip6 and it is very minimalist. And three, Grip6 has a breaking strength of nearly two tons. No offense, but I think your very fine "genuine" leather belt would tap out at like a quarter of that. @Shelly besides what Mike said, it's extremely lightweight and comfortable. It feels like you're not wearing a belt. Plus it's really low profile and won't bulge under a tshirt. And really the biggest reason I designed it is because I don't like the look of leather belts with the holes and belt flap. So it's another alternative to a leather belt. @Steve Get a friend in the USA .... it may end up costing you a tiny bit more in time and money, but you could have it shipped to them first, and then to you. @Steve send me an email and I'll see if we can get this figured out for you. @BJ email sent ... Thanks ! @Heatehr right now our sizes are geared for men/women. We hope to offer it soon. Thanks! Would you recommend that someone attempt to use this type of buckle and belt as part of a climbing rig? @Gregory this belt is not meant for any type of safety support (other than keeping your pants from falling down). We have done some demonstrations showing that it is extremely durable, but it's definitely not meant to be used as a safety mechanism. Have you considered offering engraving? All you need is 26 letters in a few different styles. Just remind everyone that engraved belts are not returnable unless there is a mistake or defect. @John Great idea! We have been considering that and it will be offered in the future. I'm assuming that since this is made of aluminum that it's not TSA compliant. (I'm assuming you would have to take it off if going through a metal detector at the airport.) Do you have any plans to make a buckle made of some sort of very HARD plastic so it wont need to be removed during the screening process? Would love to have a belt that I can use everyday AND when I'm at the airport. @Gehrig A lot of people have expressed interest in that exact idea. We will actually be launching a Kickstarter later this month for a carbon fiber version. It will have all those features you just mentioned. @Jerry I was on a plane on Wednesday and went through 2 TSA checkpoints and it was totally fine. But some people have had issues. I guess the real answer is sometimes. We are actually working on a new carbon fiber version and it will be launched on kickstarter later this month. It will go through TSA security with no problem. Husband has 44" around belly button, 42" further down. He likes to wear up higher. We want a black belt, but you only have 40". Will this work or should we wait to have 50" in stock? @terry I just checked and the 50 is in stock. Try again and let me know if you can see it. Here’s one way to look sharp: laser-cut aerospace grade aluminum. That’s the material found in the buckles made by Grip6—a company specializing in rugged, low-profile belts. With a smart, minimalist design that’s ultra trim and insanely strong, every belt is made from nylon webbing with a breaking strength of almost two tons. The no-holes design adjusts to your perfect length. The extra flap tucks neatly inside—out of sight—and the buckles are curved ever so slightly. The result is a streamlined, smooth fit. Founder BJ Minson found a lot to dislike with traditional belts. The stretched out holes, the limited range when adjusting, the extra flap. When a friend gave him an army belt, BJ was inspired by the simple design. He started to create the belt he always wanted.